A tempting e-mail arrived in my Inbox yesterday: an invitation to Atlanta Bead Company’s warehouse sale, only days away! I remembered all the goodies I brought back from last year’s event and then it hit me. Where are all those irresistible bead buys now? Ninety percent of them are still in their plastic bags, waiting to be tumbled out on my bead mat and brought to life. I’ve given myself a challenge. 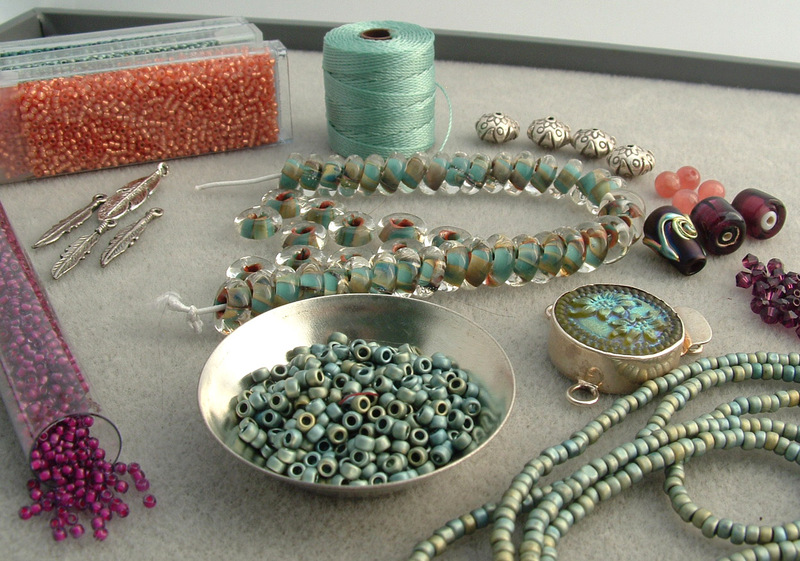 For the rest of the summer, the next 60 days until Labor Day, I am going to create exclusively from my bead stash. Beginning with this tray, all culled from my existing stash and waiting to answer this week’s Inspired by Nature challenge from Heather’s HumbleBead blog. Due Sunday! Yikes!!! I love your colorway! And WOW what a clasp! What color (#?) are those pale blue/green seeds? They're a really versatile color! I snatched them up in size 11's and 8's. The 11's are marked F460Q - Matte Metallic Green/Blue. The 8's (shown strung and in the small silver bowl)are F460E.